A very warm, friendly and artistic elderly person who lives in a lovely, quiet road just a 5-10 minute walk to Tufnell Park tube, and very close to Hampstead Heath, is looking for someone to share their charming home. 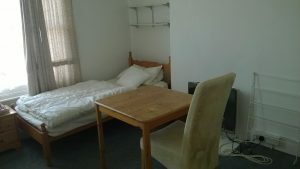 In exchange for the very low cost accommodation, you will offer up to 10 hours of practical help each week, plus some additional friendly companionship. You would be free to go off to work or study during the day, and give the help in your spare time. The ideal time for help is a little in the morning before you leave for work/college at around 8.00/8.30am and then again in the evening when you are home. You would have your own bedroom/sitting room on the second floor; you may share a small kitchen with one other lodger and the bathroom with lodger. The elderly person has always been independent but would like the reassurance of someone living in her home who will keep an eye out for them, as well as giving some simple practical help such as cleaning the house once a week, shopping, carrying things up and downs the stairs, putting the bins out, changing light bulbs etc. There is a delightful cat in the house and one other task for the Sharer would be to look after the cat when this elderly person is away, which she does a reasonable amount as she has family overseas. A cat lover is therefore essential! No Animals as there is already a cat in the house.